I’ve mentioned before that I’m a big fan of audio books. When recently faced with several commutes to the bay area, I wanted a story to listen to. I picked a contemporary spy novel, The English Girl, by Daniel Silva, rated as one of Amazon’s “Best Books for July,” last month when it was published. This was my first encounter with Silva’s work but the 13th in his spy thriller series featuring Gabriel Allon, an art restorer and master spy for the Israeli Secret Service. Few audio books are exciting enough to make me regret arriving at my destination, but this was one. British Intelligence contacts Gabriel Allon, the best man they know for the job. Hours later, Allon and a British ex-patriot assassin are plowing through the Corsican and French underworlds, trying to find the girl while there’s still time. The affair goes horribly wrong, but not everything is as it seems. Allon discovers that North Sea oil drilling rights lie behind the kidnapping, along with trechery at the highest levels of British Government. “If you go to the City of Heretics (Moscow), you will die,” an elderly Corsican sooth-sayer tells Allon, but that is his next destination, with a strike team out for revenge and the truth. The truth they discover is more than even Allon expected, one that will shake the highest levels of British government – if his team can make it out of Russia alive. 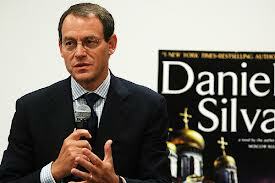 Some reviewers call Daniel Silva the greatest spy novelist of his generation. I don’t know the genre well enough to be sure, but based on The English Girl, it’s a claim that could be true. 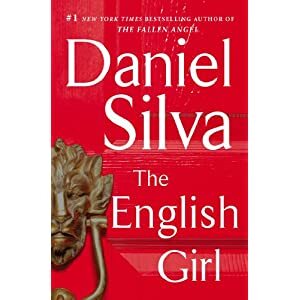 This entry was posted in Authors, Book Reviews, Books, Novels and tagged authors, book reviews, books, Daniel Silva, Gabriel Allon, The English Girl. Bookmark the permalink. I’ve been thinking about reading this one and glad I read your review. Thanks! I’m very glad it was timely for you. This sounds like a real thriller. Were I still teaching, I’ll bet I could use this one to teach the hero cycle. I think so. There’s something I’ve been trying to articulate to myself by discussing in recent posts and mulling over. Both Gabriel Allon, in this book, and James Bond in an earlier series, had the knack of doing precisely the right thing at the right time in the service of a cause. That seems a prominent hero quality. Of course in the post 9/11 world, where terrorism is the enemy (author Daniel Silva was posted to the middle-east in his CNN journalism days), there’s less of the British sense of “fair play” of Bond (parodied in the Austin Powers movies), but the heroic quality is still present. An aspect of Silva’s writing that only became apparent to me after listening to him being interviewed by Elaine Charles from the Book report radio show, is his affinity for recent political news. In the interview he speaks of how “The English Girl” has become even more poignant and relevent in the advent of the privacy bill and the NSA’s powers being debated in congress, as well as the whole Snowden affair. Wonderful book. That makes sense. His bio summary lists time as a CNN correspondant from the middle east, and his knowledge of European and middle east locations and customs seemed vast. Thanks for your comment.